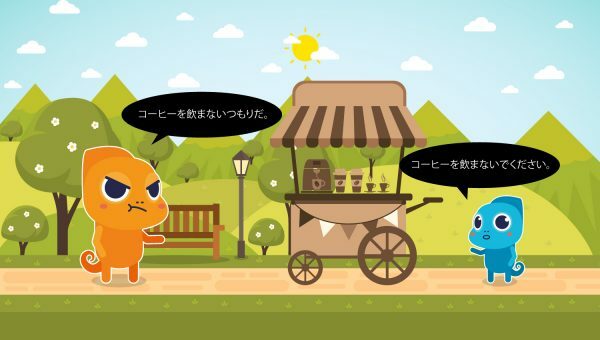 This article is a continuation of our series of articles on Japanese verbs and verb conjugation. 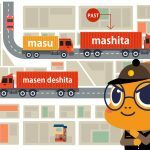 For our articles on using -Masu Form, click here (-masu and -masen) and here (-mashita and -masen deshita). 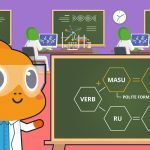 Our -Masu/-Masen article also contains a lot of general information on Japanese verbs and verb types, so if you are not familiar with Japanese verbs you may want to look over that article before reading this one. 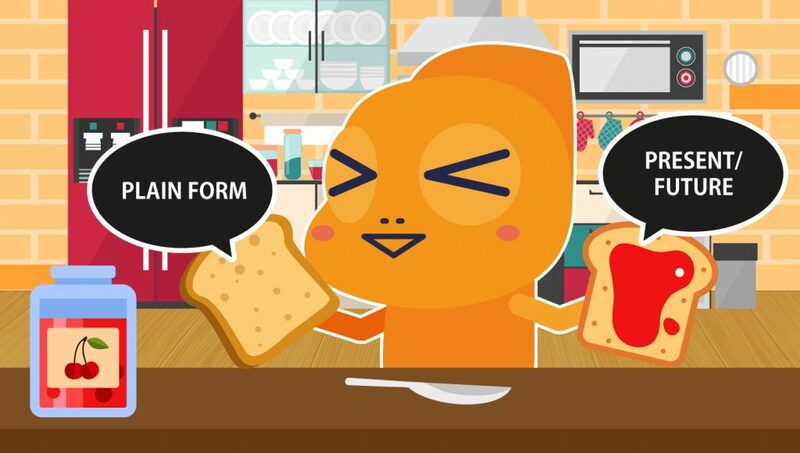 In this article, we will be introducing Plain Form, and how to use the plain form of Japanese verbs in the present/future tense and negative present/future tense. For our second Plain Form article (in which we discuss Plain Form past tense and negative past tense), click here. For other articles on Japanese grammar and conjugation, click here. Plain Form has many alternative names. Other books or resources may refer to it as Dictionary Form, Short Form, or Casual Form. Plain Form is so called because it is the form commonly used in casual (plain) conversation, and because it is most closely related to the way verbs are displayed in dictionaries. When you read a verb in the dictionary, it is already in plain form, and in present/future tense. Technically, you don’t need to do anything to it in order to use it. In Japanese, the same verb tense is used when talking about the present and about the future. can mean “I wake up at 8:00” (as in, I generally wake up at 8:00) or “I will wake up at 8:00” (as in, tomorrow/on a certain day specifically I will wake up at 8:00). This is true of other patterns such as -Masu Form as well. The -Masu Form of 起きる okiru (起きます okimasu) can mean both “I wake up” and “I will wake up.” Generally speaking, Plain Form verbs in present/future tense mean exactly the same thing as -Masu Form verbs in present/future tense – the primary difference is that -Masu Form verbs are more polite. As is the case with -Masu Form verbs, if no person is mentioned in your sentence, it will probably be assumed that you are talking about either yourself or whoever was most recently a topic of the conversation. 起きる okiru could technically mean “I/he/she/they/etc will wake up,” all depending on context. Conjugating a Plain Form verb from present/future tense to negative present/future tense is a bit more complex than conjugating -Masu Form verbs, but still does follow a fairly simple pattern. If your verb is a Ru Verb, all you need to do to make it negative present/future tense is remove the る ru and replace it with ない nai. I won’t/don’t wake up at 8:00. Similarly to present/future tense, negative present/future tense can refer to something you do not do, or will not do. It depends on the context. 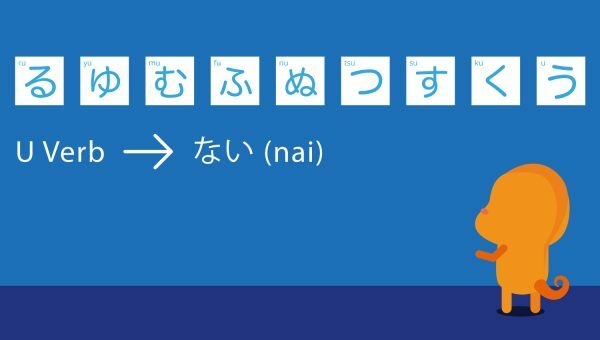 If your verb is an U Verb, you must change the final vowel of the verb, and then add ない nai. Because Japanese has a syllable-based writing system, changing the final vowel means you must change the entire final syllable of the verb. To determine which syllable you will change it to, first check your verb to see what consonant its final syllable begins with. Then, find that consonant row on a hiragana chart, and slide along the row until you intersect with the “a” column. This is so that the verb does not become awkward-sounding. “Kaanai” would be much harder to pronounce than “kawanai,” right? Kyou wa nichiyoubi da kara, tomodachi to toranpu de asobu. Today is Sunday, so I will play cards with my friends. I will wear my new shirt. Ashita wa tesuto ga aru kedo, benkyou shinai. Tomorrow I have a test, but I will not study. Ashita wa shigoto mo aru kedo, hayaku nenai. Tomorrow I also have work, but I will not go to sleep early. Asa wa tabun ko-hi- o nomanai to ikenai. In the morning, I will probably have to drink coffee. What is Plain Form for? Plain Form can be used anytime you are speaking casually with friends or family members. This is why it is the form you will tend to hear in music, anime, film, and TV shows (not that you will never hear polite verbs or -Masu Form in these media, but Plain Form is what you will more frequently hear — unless you are watching a workplace or historical drama, most TV or anime characters speak quite casually, and frequently quite rudely). Even when speaking politely, you will often need to include Plain Form verbs in your sentences. The final verb of a sentence is truly what determines how polite the sentence is (for more on this, please see our -Masu Form articles here and here). Let’s take a quick look at what happens when a Plain Form negative present/future tense verb is followed by といけない to ikenai. It can be made polite by changing the いけない ikenai to -Masu Form (いけません ikemasen). Heijitsu wa roku ji han ni okinai to ikenai. On weekdays, I must wake up at 6:30. Ko-hi- wo nomu tsumori da. I intend to drink coffee. Ko-hi- o nomanai tsumori da. I intend to not drink coffee. Ko-hi- o nomanai de kudasai. Please do not drink coffee. That’s all on Plain Form for this article, but there are two more plain form patterns (past tense and negative past tense) that we did not have time to discuss. To read our article on Plain Form past and negative past tense, please click here. Also, please check out our Library for a series of Free verb flash cards! Try making a few sentences or a short narrative, and share what you’ve written as a comment! 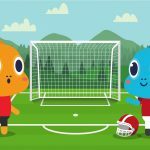 If you’d like a refresher on particles (は wa, が ga, を wo, に ni, etc) and how to use them before you make your sentences, click here to view all of our particle articles.